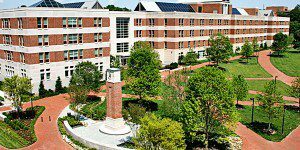 Where is the best online MBA program in the country? Who tops the charts when it comes to student engagement, student excellence, academic faculty, and more? The U.S. News & World Report just released its 2019 ranking for the “Best Online MBA Programs” in the US. The Online MBA programs at Indiana University’s Kelley School of Business and UNC Chapel Hill’s Kenan-Flagler Business School each came in tied at first place. In 2016, the number of students taking online classes reached more than six million, according to a 2018 Babson Survey Research Group report. Nearly three million exclusively took distance education classes for their graduate and undergraduate degrees. There’s no doubt that online learning has grown in popularity and will continue to grow, with Babson study co-author Julia E. Seaman saying, “The growth of distance enrollments has been relentless.” And MBA programs can’t stop or avoid the tide. Over the last eight years, U.S. News has ranked the best online MBA programs to find the accredited public, private, and for-profit business schools that rate highly according to a questionnaire sent to students and faculty (more on that later). This year, the U.S. News collected data on 301 schools—up from 282 last year—to give one of the most comprehensive rankings yet. Over 300 schools were reviewed for the most recent U.S. News & World Report “Best Online MBA Programs” ranking. This year’s Online MBA ranking was filled with a familiar cast of programs but with a change-up of order. For the four previous years, Temple University’s Fox School of Business topped the ranking until it was thrown out for misreporting critical data. Now, with the new ranking data, IU Kelley placed first for the second year in a row for its gold standard classes and 100 percent student employment rate. Tied for first place this year is UNC Chapel Hill’s Kenan-Flagler Business School, rising in the ranking up from fourth in 2018. At the same time, Carnegie Mellon’s Tepper School of Business fell from first place to third. Rounding out the top five in 2019 is The University of Florida Hough Graduate School of Business in fourth (up two spots from last year) and the USC Marshall School of Business in fifth (up three places from 2018). No school fell out of the top ten this year. Instead, all top ten schools remain the same as the previous year, just shifting rankings. The biggest gain was made by the University of Mississippi Business School, which ties with Auburn University Harbert and Penn State World Campus for ninth place. This was a sixteen place jump from 2018 when Mississippi ranked 25th overall. The top two schools to make the list—IU Kelley and UNC Kenan-Flagler—were also the largest programs by far with both schools just barely under 1,000 students enrolled. The next closest school regarding the number of students was the ASU Carey School of Business, enrolling just under 500. As for cost, the honor for the most expensive school in the top ten went to Carnegie Tepper. Students in the Online MBA program there pay $2,063 per credit hour. That’s more than double the cost of the two most affordable schools in the top ten Auburn University Harbert and the University of Mississippi, which cost $875 and $810 per credit hour, respectively. U.S. News’ five-tier methodology in its Online MBA ranking values engagement above all-else. To rank the 301 business schools, U.S. News & World Report broke down a student and faculty questionnaire into five categories with varying weight. Here’s a look at each category and how it was weighted in the current ranking formula. Engagement looks at how an online MBA program promotes participation in courses and encourages interaction with instructors and classmates. The idea was to look for online MBA programs who had instructors that were accessible, responsive, and willing to create a rewarding experience. Excellence looked at how well prepared MBA candidates were to handle the workload. It gave weight to standardized test scores, acceptance rates, undergraduate GPA, and work experience. To garner expert opinion, the US News surveyed high-ranking academic officials at each MBA program to account for intangible factors that demonstrated academic respect. Instructors with impressive academic credentials were also important to the ranking. Specifically, the US News looked for faculty credentials that mirrored those of campus-based programs. Strong online MBA programs require schools to incorporate a diverse array of online learning technologies, which allow more flexibility for distance learning. The ranking looked at services and technologies outside of class, strong support structures, career guidance, financial aid resources, and more.